Unknowingly, I landed in Rome on the day the summer sales began, on a warm weekend in June. 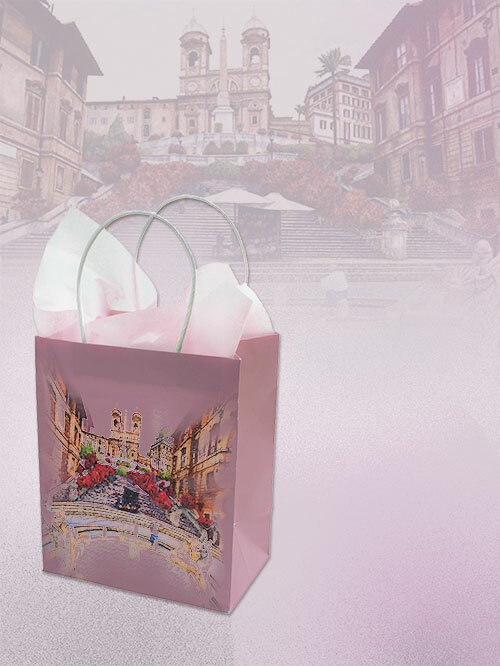 I of course had no idea of the treats in store for me as the concierge of the Bettoja group’s Hotel Mediterraneo guided my excited shopping queries to the Spanish Steps, an area that I had over the years carefully avoided, as being touristy and overcrowded. However, with hallowed visits to the Colosseum and St Peter’s Basilica, the Sistine Chapel and Vatican Museum out of the way on previous trips, I decided to check out Rome’s retail therapy and boy was I floored! See Rome and die, I told myself, but of course with shopping bags clutched firmly in hand. If London, New York and Milan have always been my favourite shopping cities, I wondered why I had not discovered this fabulous Italian shoppers’ paradise earlier. Was it because Rome’s ancient splendours refuse to be denied and remain uppermost in mind? Or that the thought of traversing huge crowds at the Spanish Steps always kept me away? I had read somewhere that the pots of azaleas that enflamed the steps with colour every May were stolen one night and the city was forced to replace them! Was that enough to have turned me away? I really cannot say but here I was in shopping paradise and with prices slashed by half, down the line, a phenomena that only the recession could provide. Encrusted with locals and tourists, the Spanish Steps fan out, 138 in all, in a characteristic butterfly plan over several levels, forming the spectacular staircase of the Trinita dei Monti, the church that dominates the square from above. They were created by Francesco De Sanctis in the 18th century, on the request of Innocent XII. Named after the Spanish Ambassador who lived there but ironically paid for by the French, the steps present a majestic urban monument of Roman Baroque style, drawing sightseers, students and shoppers in hysterical numbers. Picnicking on the steps, which have been renovated several times, has been made an offence. At the foot of this sweeping vista is the famous Barcaccia fountain, credited to Pietro Bernini and his more famous son, Gian Lorenzo, in the form of a sinking ship with water spouting from gentle leaks, unlike the sheer gush of the Trevi Fountain (a must visit despite crowds). The fountain recalls the historic flood of the River Tiber in 1598 and refers to a folklore involving a fishing boat carried away by the flood and discovered at this exact spot. The story goes however that this was a convenient way of dealing with low water pressure, a technical problem that the creators were forced to deal with. Now, this is the deal! 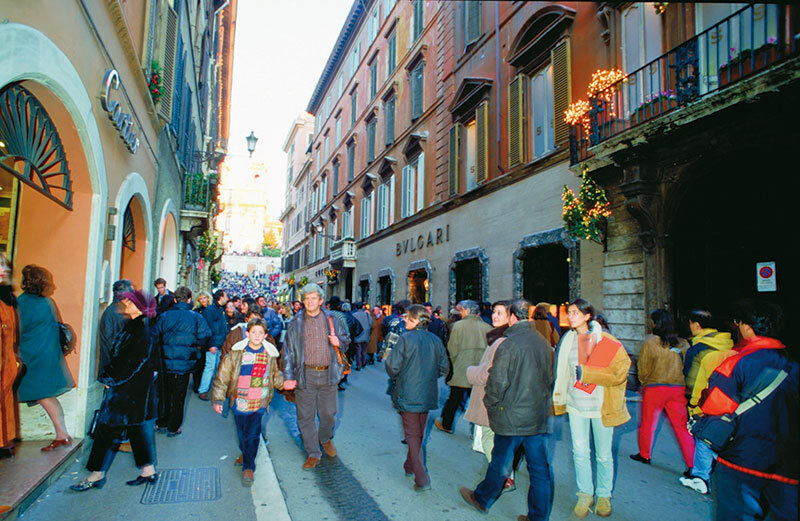 Rome’s, and I would say the world’s, most exclusive fashion streets are three – Via Condotti, Via Borgogna and Via Frattina – and run parallel at the foot of the Spanish Steps, starting from the Piazza di Spagna and meeting up at the Via dei Corso. One of Rome’s most expensive streets is the Via Condotti which brings major Italian labels and other world labels into the same neighbourhod, sharing walls and rubbing exclusive shoulders. Via Condotti, I discover, owes its name to the channels that carried water to the Agrippa thermal spa baths. The shops are normally closed on a Sunday but today, the excitement and bustle are palpable as all remains welcoming on the first weekend of the summer sales. Everything is discounted at 50 per cent and I vow to myself that this date will forever grace my holiday diary. I know not which hallowed portal to enter first and decide on Christian Dior which dazzles at the beginning of Via Condotti. A cherry-red quilted mini tote drives me to distraction and I walk on to Gucci discovering that they allow only a handful of people to enter, at any one time. Opposite, A. Testoni beckons with amazing prices for suede driving shoes, a passion with my young sons. The Louis Vuitton store, besides being the most crowded, maintains its distinction of being the only outlet not on sale. The earth may shake and heels may break and bags fall from mountain tops before LV in its dedicated stores, ever goes on sale. Needless to say we barge right in and my older son walks out moments later, a huge bag under his arm and a smile even larger. Well! We discover ourselves running helter skelter into Jimmy Choo, Max Mara, Prada, Salvatore Ferragamo, Valentino, Cartier, Giorgio Armani and Tod’s. We discover a line outside the shoe store Hogan and I am informed that this is Tod’s other label, obviously popular among locals. When the crowds clear, I discover imaginative and stylish sneakers studded with sequins, glitter and things fabulous, besides platform shoes and sandals. I am now rushing into Dolce and Gabbana in the Piazza di Spagna, to discover a pair of gold sandals reduced to affordability. Opposite is the always more reasonably priced Furla which beckons with practical handbag styles and prices, while never compromising on quality. I wonder if this will be the day that I will fulfill my dream of getting into a silken Missoni knit dress, which I have long craved but never afforded. (Next year perhaps?) The iconic Chanel and Etro’s brilliant hues call out from an adjacent street while the boys run into Zara and Ferrari Store on the adjoining Via Tomacelli as well as the prohibitively priced Iceberg and the ever-trendy jeans outlet Diesel. Local shoe shops invite with their variety and contemporary styling as well as the coveted ‘Made in Italy’ mark. Specialty shoe maintenance stores are rummaged through for protective polishes, insteps and white polish for the Car Shoe moccasins purchased earlier in Capri, which are an impractical pure white. One-of-a-kind boutiques offer browsing pleasure among racks of unusual clothing. We discover the tiny but scrumptiously laden Fabbi Salsamentaria delicatessen where we stuff fresh-smelling crusty bread with sliced-at-that-moment local San Daniele prosciutto and mozzarella di buffalo with a drizzle of olive oil and finish off at the patisserie next door over dessert cups overflowing with tiramisu ice cream and sugary palmiers.